Playing online games often exposes one to the worst of humanity. Within this den of scum and villainy you’ll find twelve year olds who act like four year olds, dudes that would be the worst drinking buddies, and silent, useless teammates that clearly have no f***ing idea how to play this damn game. Of course, when gamers act like jerks, it’s not always their fault. Sometimes it’s the game’s fault. Kotaku’s review of Monaco arrived a week after the game’s launch, which left it in the unique position of being able to review the nature of the community that formed around the game. To Stephen Totilo, who reviewed it, it seemed as if the online world had suddenly become human. Of course, YMMV. I’m sure there are trollish Monaco players, and when the game is released on the Xbox 360 this Friday (May 10th), the community might be very different. But for now, let’s take a look at some of the design considerations that were taken that may have something to do with the positive nature of Monaco’s online community. 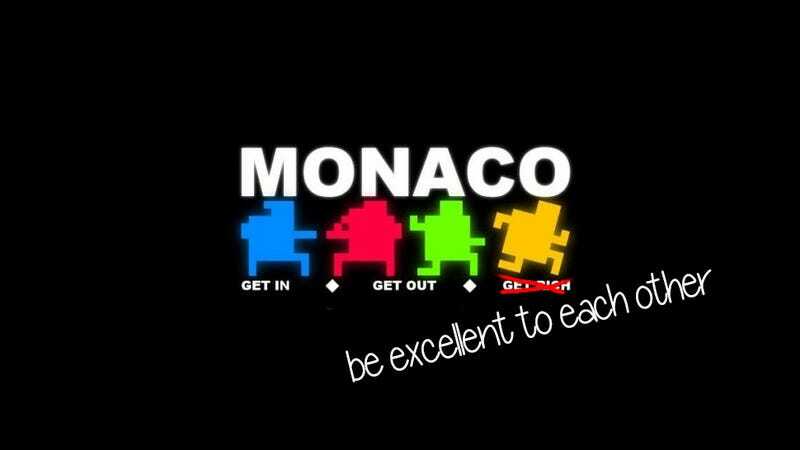 When I first pitched Monaco to a big publisher, it was rejected because “games that require co-op don’t sell well.” And perhaps this is why online games are so often fraught with uncooperative communities. There is a big difference between co-op games that require cooperation vs. games that simply reward it. A game like Team Fortress 2 rewards cooperation but doesn’t require it. If your teammates care more about teabagging than stealing the briefcase, that’s their prerogative and you have no choice but to ignore them or find a new server. If a player wants to ignore the fact that they are on a team, they can essentially play in a go-it-alone style. Deathmatch trumps Team Deathmatch. This attitude tends to be contagious, too — once the cooperative social fabric starts to break down, it’s hard to build back up. But in Monaco, the game requires that all four players pile into the same staircase in order to progress, every sixty seconds or so. And when a player dies, the group can’t progress until someone has gone back to heal their teammate. This forced cooperation both reminds players that they are working towards a common purpose, and probably wards off the players that simply don’t like cooperating. Between those 60-second segments, all hell breaks loose. Thieves will run around, collecting coins like mad. A hectic playstyle trumps strategic play, which trumps slow and stealthy. But, on a team of only four, players can often agree before they start the heist how they want to play. These types of agreements tend to break down in games with larger teams. A more intimate cooperative experience lends itself to a more human interaction. Other players in Team Fortress 2 may as well be bots, while the co-op partner in a game like Journey feels distinctly human, because there is only one, and he or she is within your field of view most of the time. In Monaco, you remember when your buddy saved you with a smoke bomb, and you care that your teammate doesn’t die, because, if he does, it will be your responsibility to revive him. In TF2, players rarely stay together, in Monaco, even when players split up, you always know where they are. Intimacy, proximity, and responsibility all create a social fabric that makes players behave like humans. Of course, the social fabric of Monaco isn’t all the result of game mechanics... it’s also the result of who we’ve marketed the game to, who we let into our beta test, and who has fallen in love with the game. While we were beta testing Monaco, we asked players to take a quick survey on the game. We asked them what they liked, what they didn’t like, what confused them. We also asked them to rate the game from 1 to 10. We wanted to find out which beta key giveaways were bringing in our most passionate users. We generally found that the highest proportion of 9 and 10 ratings came from RockPaperShotgun and Reddit users. Our lowest ratings came just after we did a giveaway via Destructoid. Many of those RockPaperShotgun users became Beta VIPs—we gave additional keys for those people to give to their friends, and we helped them set up the fansite www.monacohideout.com. Those passionate, mature voices helped us police our various YouTube videos, kept things running smoothly on our forums, and helped to introduce the game to the world from the perspective of fans rather than developers. They established the tone, and the overall community has maintained that fabric. Building a co-op game is really not all that different from designing a commenting system for a blog. How do you allow people maximum freedom while maintaining a level of maturity and collaboration that is often missing from anonymous internet cesspools? In Monaco’s case, it came down to demographic targeting, required cooperation, and intimacy. Or maybe people just read the message I put in the credits. Don’t be nut-punchers. Even on the internet. Andy Schatz is the co-creator of Monaco. Find out more the game at the official Monaco website or on Facebook and Twitter.